The beaches up here in New England have opened back up to our canine companions and with that naturally, comes some risks. The obvious risk of drowning or cutting a pad on a shell is certainly present but there is a very serious condition that many of us do not think about – certainly not on a regular basis. Dogs can die from drinking too much water, yes you read that correctly. The condition is called hyponatremia, where the sodium levels in the blood drop to fatal levels. Sodium levels drop because the body has taken in too much water, thus diluting the needed sodium required for organ function. This is also known as water intoxication. We don’t think about it when we’re repeatedly throwing the ball or stick into the lake for our pups but every grab for their coveted object also means a good amount of water gets ingested. Do this enough times and you can see the problem. Our friends at Top Dog Tips have provided this great infographic that helps illustrate exactly what happens when a dog experiences water intoxication. This family experienced the detrimental effects of water intoxication unknowingly at a family gathering where their daughter enjoyed a game of fetch with their mini schnauzer. The pup willingly chased the stick into the lake repeatedly, but shortly after the family noticed he was lethargic and acting drunk. Within two hours he died. Please be aware of the amount of water your pet could be ingesting while playing in or near a body of water. Even the few dogs I have that are not big swimmers, will wade near the water’s edge and absolutely enjoy taking big drinks from the cool pond or lake. 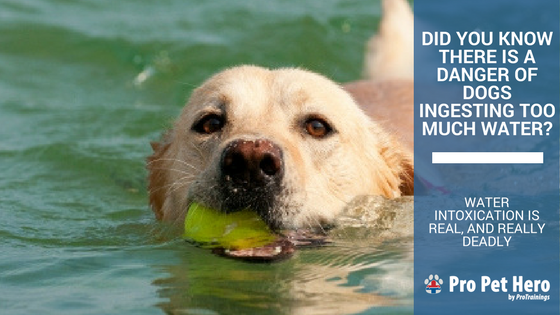 Be cautious to limit the amount of playing fetch in the water and monitor your pet’s health at all times while out and about enjoying the beautiful weather. 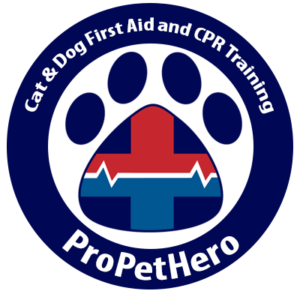 To better understand the signs of water intoxication and to better train yourself to recognize when things might be off with your pet, take our pet first aid course – our pets cannot talk but they certainly have ways of telling us they need help, it’s up to you to learn what they are saying. Our course also covers drowning which is the most obvious threat, but take the time to learn the best ways to prevent, recognize and act when your loved-one needs it. Below is a video of one of my dogs swimming, he frequently chokes on water he ingests while looking for sticks and most definitely ingests plenty. We monitor and leash him frequently. My female takes the opportunity to constantly drink the water as she will not swim which also posses a risk. Thank you for sharing your story and the information that will save lives! As a pet parent, I appreciate your very clear advice on preventing a heartbreaking disaster. Thank you for taking the time to read it so we can all keep our pets safer.